Chromecast is an affordable TV streaming device, available in three different models. So which Model of Chromecast to buy? 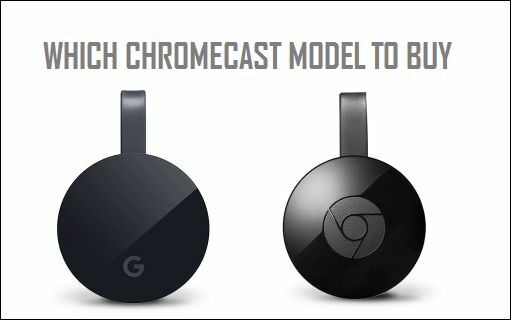 Let us try to answer this question by taking a look at the differences and the similarities between the available Models of Chromecast. Chromecast was first released by Google in 2013 as an affordable $35 device that could allow streaming of videos and movies from YouTube, Netflix, and other popular video sources onto the larger screen of your Home Television. The second generation of Chromecast was released by Google in 2015, along with Chromecast Audio, another useful device that can convert your dumb speakers into smart ones. In 2016, Google released Chromecast Ultra, which can be considered as a totally new version of Chromecast costing $69, instead of $35 for the first and second Generation of regular Chromecast devices. With all three Models of Chromecast being available in the market, most new buyers do not know which one to buy and those who are already using a Chromecast device are left wondering as to what they are missing and should they be upgrading to Chromecast Ultra. Let us take a look at the similarities and the differences between the 3 different Models of Chromecast, so that you can make an informed decision about the right Model of Chromecast to buy. 2. TV Remote: All models of Chromecast support HDMI CEC, which allows you to use the Regular TV Remote to control videos playing on your TV via the Chromecast device. 3. Google Home App: All Chromecast Models make use of the same Google Home App to cast content from your iPhone, Android Phone or tablet to TV. 4. Power Supply: All Models of Chromecast are powered by a Micro USB adapter. 1. WiFi Network: First Generation Chromecast supports 2.4 GHZ WiFi Network, while Second Generation Chromecast and Chromecast Ultra support both 2.4 GHZ and 5 GHZ WiFi bands. 3. USB Ethernet: The USB adapter that comes with Chromecast Ultra also supports Ethernet connectivity. Note: You can provide Ethernet connectivity to the First and Second generation of Chromecast by using a power-plus-networking adapter for $15. The biggest difference between the First Generation Chromecast and the second Generation Chromecast is that First Generation Chromecast supports 2.4 GHZ WiFi network, while the Second Generation Chromecast supports both 2.4 and 5 GHZ WiFi bands. What this means in practical terms is that second Generation Chromecast will be able to switch to 5 GHZ WiFi in case 2.4 GHZ network is crowded in the area where you live. Hence, our recommendation would be to go for the Second Generation of Chromecast, as it is likely to provide you with better connectivity and better user experience due to its ability to use the less crowded 5 GHZ WiFi network. In our opinion you should definitely upgrade to second Generation Chromecast in case you are experiencing slowing down or interruptions while watching videos or movies. This is happening due to 2.4 GHz coverage being too congested in the apartment or area where you live. Since, Second Generation Chromecast supports both 2.4 and 5 GHZ WiFi bands, it will be able to switch between the two WiFi bands to provide you with the best connectivity. As mentioned above, Chromecast Ultra is the only Model of Chromecast that is capable of playing 4K videos and you should go for this Model of Chromecast only in case you already have a 4K capable TV or you are planning to buy 4K Capable Television in the near future. Also, you need to be aware that 4K content is very limited and not as widely available as 720p and 1080p HD content.